When New York Times reporter Susanne Craig checked her mailbox last month, she was greeted with a surprise. She said the envelope waiting for her contained three pages -- each from 1995 tax returns filed by Donald Trump. "I don't think it's a crime to check your mailbox," Craig said on CNN's "Reliable Sources" on Sunday. "And that's what we did, and then we did some reporting." Craig's report, published on the Times website Saturday, indicates the Republican presidential nominee took $916 million in losses in 1995, an amount so significant he could have avoided paying taxes for years. In response, the Trump campaign claimed the 1995 document "was illegally obtained" and said the article proved that the Times and the "establishment media" are an arm of the Clinton campaign. 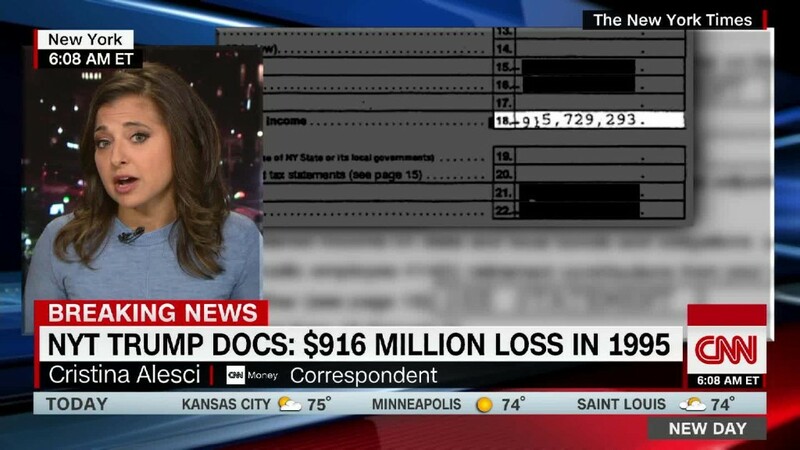 CNN has not verified the documents. Craig said they were authenticated by a certified public accountant listed as the preparer on one of the forms. Though the envelope was sent anonymously, the mail was postmarked from New York City, and the return address claimed the file had been sent from Trump Tower. It's a story that could shape the remaining weeks of this year's election. Trump has so far refused to release his tax returns. And more could be coming. On "Reliable Sources," CNNMoney's Brian Stelter asked Craig whether the Times had more documents. "We're doing a lot of reporting around this. So we're going to keep going," she said. "Maybe a 'no comment.'" NewsBusters executive editor Tim Graham attacked the piece as partisan spin. Speaking on "Reliable Sources," Graham said the Times report amounted to a Trump take-down, citing pieces written by the Times' editorial board denouncing the candidate as evidence. "This paper has all the restraint of a pack of flesh-eating zombies," Graham said. The Times editorial board is separate from its news-gathering operation.